It's easy to use the AM2320 sensor with Python or CircuitPython and the Adafruit CircuitPython AM2320 module. This module allows you to easily write Python code that reads the humidity and temperature from the sensor. One thing to watch out for with the AM2320 is that it goes into 'sleep' mode, you may find if you are scanning the i2c bus that the device does not appear - try scanning again and it will appear the second time! The Raspberry Pi has built-in pull up resistors on SDA/SCL so we don't include them here. 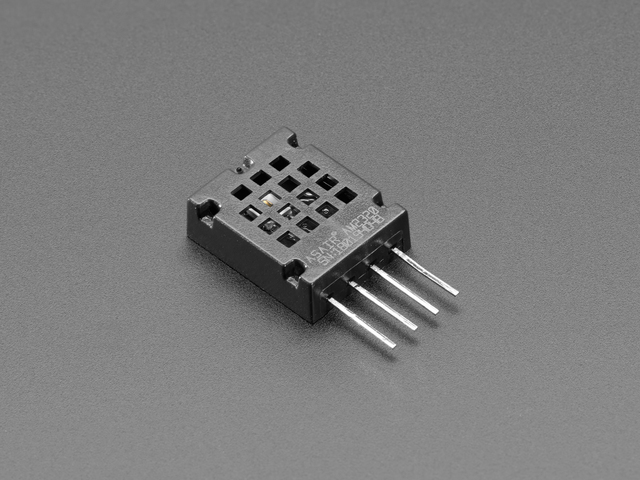 If you are using some other computer, check if you need to add your own 2-10K pullups to 3.3V! Next you'll need to install the Adafruit CircuitPython AM2320 library on your CircuitPython board. You can also download the adafruit_am2320.mpy from its releases page on Github. Before continuing make sure your board's lib folder or root filesystem has the adafruit_am2320.mpy, and adafruit_bus_device files and folders copied over. If you want to take another reading, wait 2 seconds before requesting temperature or relative_humidity again. Data in the sensor is only updated every 2 seconds! That's all there is to using the AM2320 with CircuitPython! This guide was first published on Mar 07, 2018. It was last updated on Mar 07, 2018.